I must have at least a half dozen decent recipes for chocolate chip cookies, but apparently that’s not enough. Leave it to the New York Times to come out with yet another chocolate chip cookie recipe, one that is being touted around the foodblog community as the ultimate chocolate chip cookie recipe. Basically, what makes these cookies so amazing is some sort of chemical process that takes place when you chill the dough for 24-36 hours. Okay, so I don’t remember exactly what happens, but it’s, you know, MAGICAL and leads to really chewy and delicious cookies. Another thing that makes these cookies so tasty is the sprinkling of sea salt on the dough balls. Salt really enhances the flavor of chocolate. Yum. Okay, so I pretty much followed the recipe exactly, except I used regular old chocolate chips instead of the called-for chocolate disks. I also don’t know if you really must go with the bread flour/cake flour combo, but I decided to give it a go. My only cautionary note is I found these cookies overbake VERY easily, so you have to really watch them in the oven. The recipe says to bake for 18-20 minutes, but I found they were done in about 15 minutes (I like my chocolate cookies to be just barely underdone). Once again, the recipe is here. Give them a shot and let me know what you think! Funny- just made the dough and sat down and opened your blog! I always chill my dough anyway- I did the regular flour and bread flour and did use larger 60% cacoa or whatever chips- I’ll let you know. It is all the buzzz! Did you find them to be better than any other cookie recipe? It seems that most people have decided to totally abandon their favourite recipe for these and I’m wondering if they’re really *that* good. good lord, it’s like the “how can we improve perfection” competition in the candy world all the frakking time now. how about you bake another batch, send them to chicago, and i’ll let you know what i think. ‘cuz it’s way too frakking hot to turn the oven on here. I need to stop reading blogs after 9 pm because I WANT THOSE COOKIES right now. And 10 pm is just too late to bake cookies since I have to get up early to work. Oh, cut-it-out! If you tell me about one more tempting recipe, I’ll just burst at the seams. Well, at least my clothes will. 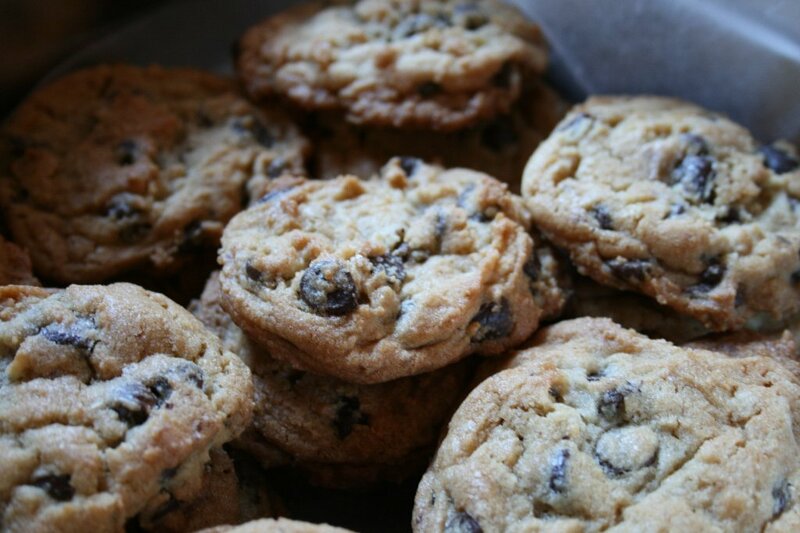 Irony of it all, I’d just sat down to read your blog after making a batch of my favorite chocolate chip cookies. can i come over every day and bake with you when i’m up there in september?? I’ll have to try these after I finish my most recent batch of cookies! I usually make my chocolate chip cookies with mini-chocolate chips, because I like them more evenly dispersed in the dough. But I bookmarked this recipe to try….wouldn’t you know that yesterday, I saw ONE box of butter in the dairy case at my supermarket, for the first time in about 4 months. I snapped it up. Ha! I’m a spontaneous baker, which means I do not possess the necessary patience for chilling dough. I make the Martha Stewart “Living Large Chocolate Chip” cookie recipe and it always satisfies (she suggests…no…I suppose Martha never “suggests”, but rather she would “implore”?, anyway she implores that one chill the dough, but I never, ever do.) Not chilling the dough is not a sin. It makes them flatter, gooey-er…..just like I like em. The butter is what makes the cookie, I think. Margarine (which IS a sin) makes them puffy. Not good. Oh, my gosh. It’s 7am and I just wrote a litany on cookies. Okay, all of this inspired me to blog the saltine cracker toffee recipe….so it’s on my blog now: http:susanmacaluso.blogpot.com and if you jump over there I have a “car candy” poll you can take because I’m liking the cool feature of adding a poll to my blog AND because I’m still hung up on this whole car candy thing. Scary, I know, I know. I wasn’t sure if I thought these were the end-all-be-all cookies until I baked the second half of the dough. Made the dough last Thursday night, and baked the first half on Sunday afternoon. Very good, but not earth-shattering. But I baked the rest last night, and oh my! Unbelievable. Sweet, salty, chocolate perfection. Thank goodness there are only 2 more cookies at home, more and I would be doomed! Yes, indeed, they are truly that good. I’m not much of a chocolate chip cookie fan (at least not the bakery style) b/c I usually find them too cakey and sweet. I followed this recipe to the letter, and they were out of this world. My husband, the chocolate chip cookie aficionado in the family, also confirmed they were the best he’d ever tasted. Jacque Torres is 2 blocks away. Just saying. I pick these up “for the kids” all the time. They warm them up for you if they’re not warm already. The disks! I never realized that what I like best about them is not the disks but the salt. Jacques Torres will still be making them in November I’m sure. I made these last week and I thought they were pretty good, but not the best thing ever. Did you notice that the recipe said it only made 6 cookies? I think I made a few dozen from the batch! thanks for the link! maybe i’m a bore, but chocolate chip cookies are my favorite kind of cookie. Hmm… I’m VERY skeptical of trying out any new chocolate chip recipes. I’ve used the same recipe for-like-ever, but, that salt thing sounds like a good idea. I always add an extra dash of salt to my recipe ’cause it does enhance the flavor. Thanks for the link!